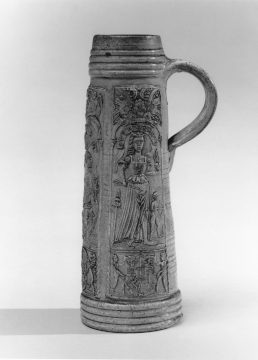 The Museum's earliest inventories (1837) refer to this glazed stoneware tankard as a 'Chopine' and record that it was discovered 'in digging the foundation of a house in Bath Street, Bath'. It bears the initials of the master potter Hans Hilgers, H H.
In his 1835 Description Soane notes that this object is 'an excellent elucidation of a passage in Shakespeare's Hamlet (Act II, Scene 2): "Your ladyship is nearer to heaven than when I saw you last, by the altitude of a chopine". He adds that It belonged to the family of the Spekes, of Hasleberry in Wilts., as appears by the following explanation of the armorial bearings with which it is decorated:- the First Coat, the arms of the Spekes of Wilts., Somerset and Devon. Second coat, 1st and 4th, the Percy arms; 2d and 3d the arms of the Willoughby family: the escutcheon of pretence pertains to the ancient name of Chawlas. Third coat, 1st the arms of Speke; 2d the extinct family of the name of Poltimore, of Poltimore in Devon; 3d the Percy arms; 4th the Lord of Iloo, of Iloo in Bedforshire, and Hastings in Sussex, the father of Anne Bullein [Anne Boleyn, second wife of King Henry VIII]: the escutcheon of pretence was anciently borne by the Lord-Treasurer of Wales which office was conferred on the representative of the family by Queen Elizabeth [Elizabeth I].